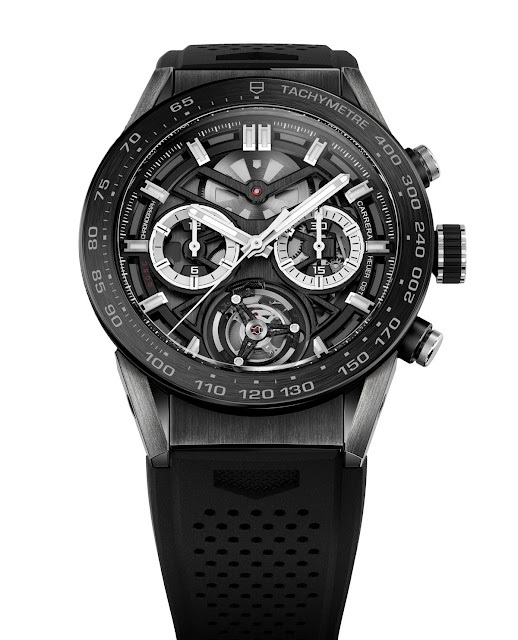 Following the launch of the Carrera Heuer-01, introduced at Baselworld 2015 as the backbone of a new collection of contemporary manufacture chronographs characterised by modular case and openworked dials, Tag Heuer announced the new Carrera Heuer-02T, a COSC-certified automatic chronograph combined with a titanium and carbon flying tourbillon. 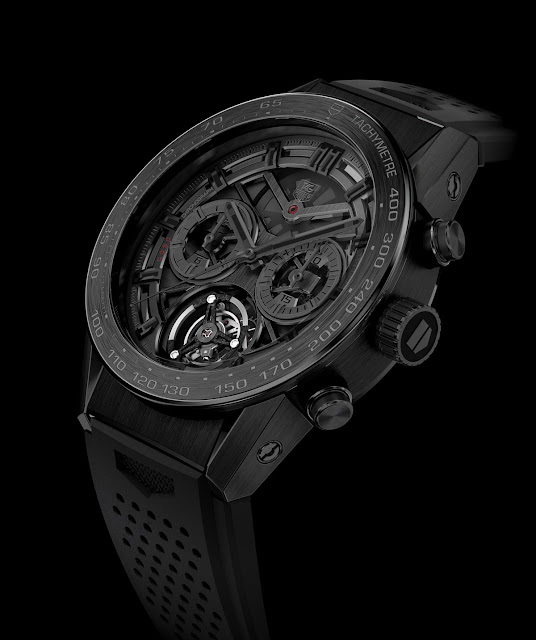 Last April we anticipated that Tag Heuer was working on a Swiss made tourbillon watch that could be retailed for less than Swiss Francs 15,000 and the Swiss watchmaker has finally achieved its goal. Thanks to the optimization of industrial processes and manufacturing costs, the new Carrera Heuer-02T (ref. CAR5A8Y.FC6377) is the only COSC automatic chronograph with tourbillon produced by the Swiss watch industry to be priced so competitively. Retail price is Swiss Francs 14,900 / Euro 14,250 / US$ 15,950. Combining a single barrel, the chronograph functions, the automatic winding mechanism and the flying tourbillon, all within a diameter of 32 mm and while ensuring a readable and aesthetically balanced dial, was the main challenge of the project. 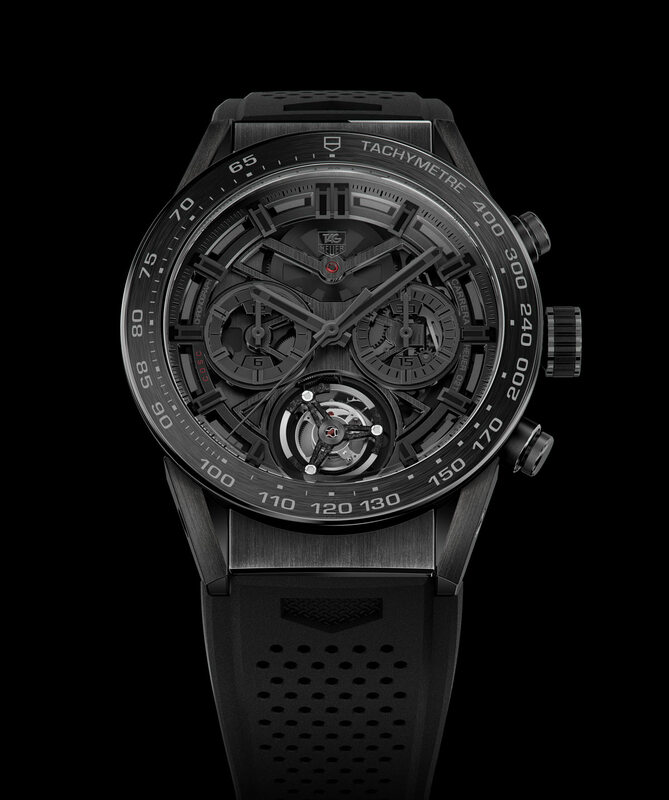 Beating at 28,800 vph, the new manufacture Calibre Heuer-02T movement has a power reserve in excess of 65 hours and is characterised by its black column wheel, black skeleton bridges and carbon/titanium tourbillon cage. An industrial framework was developed to optimise assembly in Tag Heuer's Chevenez workshops. It houses a lightweight tourbillon hand-crafted by 4 watchmakers, inspired by the Monaco V4's tourbillon, which has central sections made from titanium and a carbon top section. All the fitting, assembly and adjustment work is performed by hand. 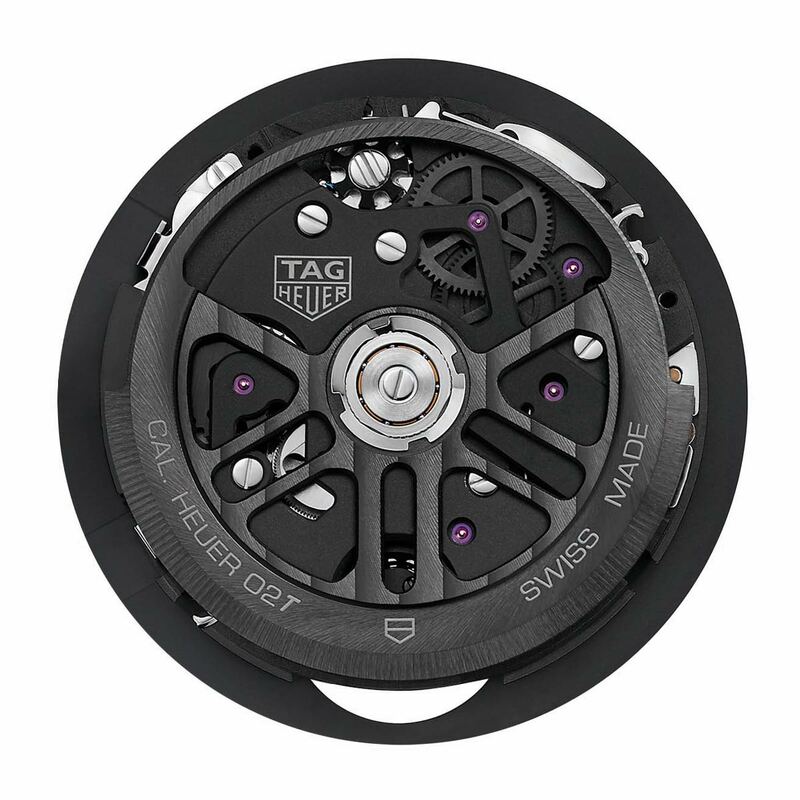 The main components are manufactured in the workshops of the Tag Heuer Manufacture. 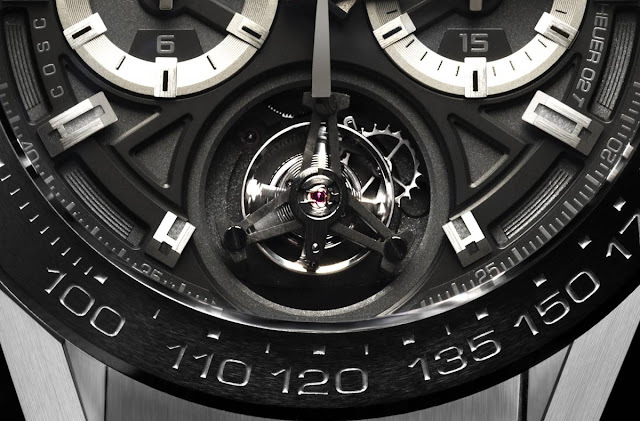 At the heart of the tourbillon, the balance spring is produced by the brand's Swiss partner, Atokalpa. 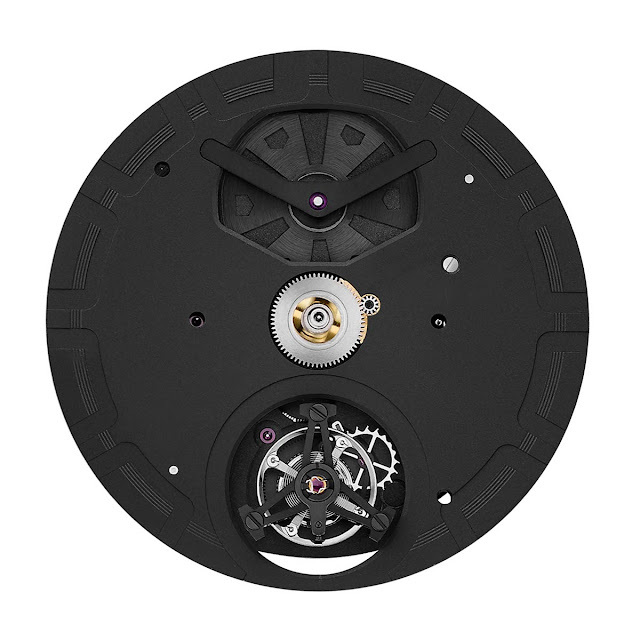 The 45 mm case is crafted from grade 5 titanium, lightweight and more shock-resistant, and uses a different form of construction with 12 modular components. This design opens up a huge range of possibilities, with an infinite combination of materials, colours, treatments and finishes. It offers water resistance to 100 metres. The bezel is made in black ceramic. Tag Heuer Carrera Heuer-02T Tourbillon. Tag Heuer announced the new Carrera Heuer-02T, a COSC-certified automatic chronograph combined with a titanium and carbon flying tourbillon.Thanks to the optimization of industrial processes and manufacturing costs, the new Carrera Heuer-02T (ref. CAR5A8Y.FC6377) is the only COSC automatic chronograph with Tourbillon produced by the Swiss watch industry with a price tag of Swiss Francs 14,900 / Euro 14,250 / US$ 15,950. 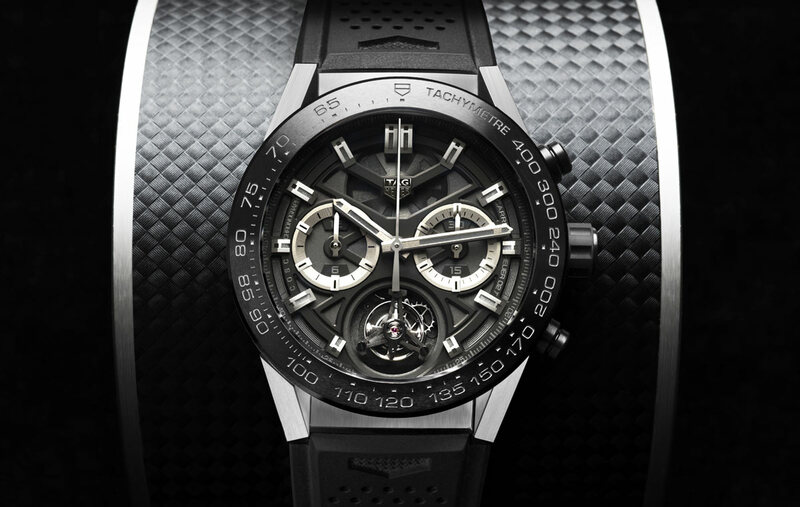 Tag Heuer also presented the Carrera Heuer-02T Black Phantom (ref. 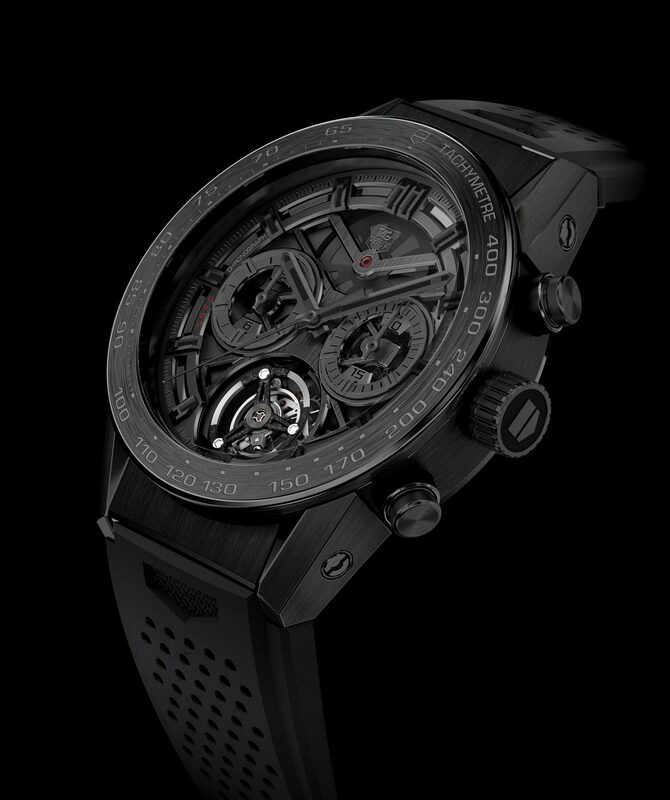 CAR5A8Z.FC6377), a full black 250-piece Limited Edition priced at Swiss Francs 19,900.